In fact, it could all be summed up in this very moment. Let me describe it for you… in detail. Right now I’m eating two slices of toast. One has homemade marmalade spread thick on it. This marmalade was given to me this morning by my loving grandmother who is lucky enough to have learned her skills in the kitchen, have the appliances and electricity to make tasty foods, and lucky enough to have close friends and family to make things for, knowing that it will be appreciated. I was lucky enough to visit my grandparents this morning because I’m lucky enough to have Sundays off, I am lucky enough to own a bike (that’s older than I am! ), fit and healthy enough to ride said bike, live in a place with quality roads that I can ride it on and where it’s generally very safe to ride. I was able to visit my grandparents because I’m lucky enough to still have them around in good health, I was able to have a wonderfully interesting conversation with them because they’re both still sharp and spent their lives caring enough to think deeply about the world so that their thoughts and ideas are still captivating. The other slice is spread thick with homemade peanut butter. The peanuts were only four dollars at Coles and my beautiful wife was lucky enough to pick up a second-hand NutriBullet cheap from someone who was lucky enough that they could afford to buy it fully price. We could pay for both because we’re lucky gainfully employed in jobs that we enjoy. I was lucky enough to be able to make the peanut butter in less than a minute because of the energy, engineering, science, economics, investment and physical labour that was all embedded into the process of getting me peanuts, a blender and electricity. I was lucky enough to get this all at such a low cost of my time, money and effort. Oh, and to add icing to the cake a beautiful day. I could go on to talk about the $3 sourdough bread, the toaster, the roof over my head and all of the luck right back to my lucky draw in the ovarian lottery but I’ll stop with one final point. It is undeniable that there are a lot of things in the world that could be better and that fact gives me a healthy dissatisfaction and a desire to share my luck in life. However, in this very moment I’m acutely aware of how lucky I am and hope that I am lucky enough to remain mindful of that fact in as many of the moments left during my short time on earth. 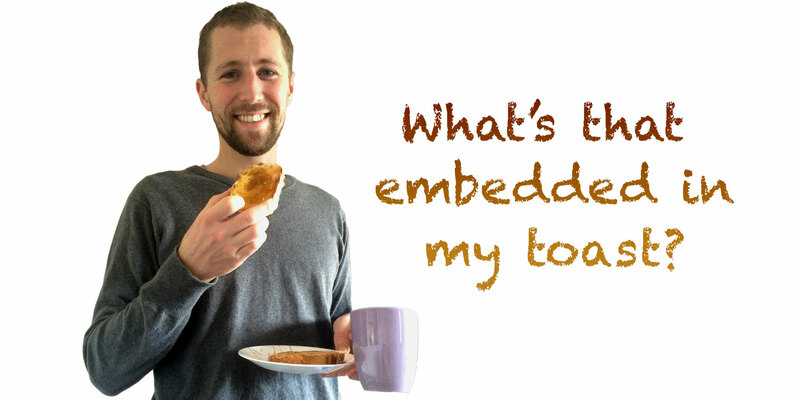 So what is embedded in my toast? A whole lot of luck.